Hotel Crosswinds Villa is a luxurious villa adorned in the undisturbed beauty of Gethia near Nainital. It is a nature lovers paradise as every nook provides a gorgeous vistas of the majestic hills. The clouds seems to be at a hands distance flowing carelessly with the gentle winds. The visitors can have quality time at the beautiful deck area ideal for tea time, basking in the sun or gazing at the twinkling stars. The covered terrace allows to feel the coolness of the rain during monsoon season. The villa is surrounded by old pines, silver oaks and deodars which offers hiking, trekking, bird watching and nature walks. The luxurious villa is located in a pristine tiny hamlet called Gethia. It is perched at an altitude of 5500 ft which makes it chilly during winters. Gethia has a great connectivity of motorable roads which is inter linked with various tourist destinations. The heavenly place is within short driving distance of Nainital, Bhimtal, Sattal, Ranikhet, Almora etc. Nainital is at a close proximity of 4 kms from Gethia via motorable short cut. The unadulterated beauty of the hills and serenity of this place makes the stay nostaligic. 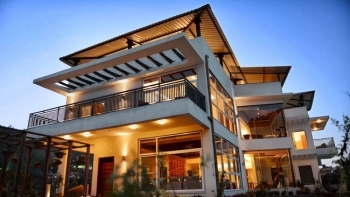 The villa has perfectly fashioned (06) large bedrooms with 5 attached bathrooms and 2 half bathrooms. The decor of the room is stunning which has a touch of modernity. Elegant furniture, dinning area, baths and soothing colour on the walls gives an authentic feel to the rooms. Entire villa is fitted with air conditioners and heaters to make the stay of guests as comfortable as possible. The villa provides all modern amenities such as LED TV with satellite channels, wi-fi connectivity available in all rooms, private balcony, power backup and 24 hours hot/cold running water. An electronic locker is provided in each room for additional safety. The Villa is located in a small peaceful village called Gethia in Nainital district. It is perched at an attitude of 5500 ft is around 320 km from Delhi. The luxurious villa is at a distance of 28 km from Kathgodam railway station. Gethia is easily accessible from various places as it is centrally located. It is at a favourable distance of 4 km from Nainital via motorable short cut and 18 km via highway. From Bhimtal it is around 28 km, Sattal 19 km, Ranikhet 59 km, Almora 40 km, Ramgarh 39 km and Mukteshwar 40 km respectively.